You might want to contact some or all of your representatives in Madison. Here is a short list. Most try to maintain that their "most important job is listening", so feel free to let them do their jobs. 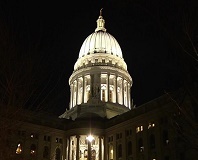 MADISON - The state Public Records Board has cracked open the door to hearing from the public about its secretive decision last summer to limit access to public records. So please let the board hear from you — let it know that it needs to rescind its action to limit access to text messages, emails, Facebook posts and other electronic communications by public employees. The State of Wisconsin also uses your tax dollars to maintain a web page at legis.wisconsin.gov that gives you plenty of information about the State Assembly and Senate, your representatives, committee assignments, and a whole lot more. Any of them may be pushing a bill or serving on a committee that could affect you, so you don't have to live in their particular districts to contact one of them. The state site also has a helpful map of Wisconsin if you need to find out who your representatives are. While you're at it, you might want to contact some or all of your representatives in Madison. Here is a short list. Most try to maintain that their "most important job is listening", so feel free to let them do their jobs.